Nice, France, May 23, 2016 /ChinaNewswire.com/ - For the Global TM Forum, Vodafone Group Plc confirmed that they would, jointly with TM Forum and Huawei, publish the Open API Map. The Open API Map is based on Vodafone and Huawei's vast project experiences and practices. It is extracted from and refines nearly 20 new APIs as well as combining with existing TM Forum’s Rest API best practices, providing a unified and standardized overview of APIs for construction of a digital ecosystem. The theme of this year's Global TM Forum is "Connecting Digital Ecosystems: Partner, Innovate, Grow". And, the Open API Map to be jointly published by Vodafone and Huawei is a significant milestone in driving API consolidation in the Telecom and other vertical industries. Firstly, Open API Map is capable of driving Carrier’s in accelerating telecom openness. In addition, it can help SMEs and developers to effectively use and manage different APIs, resulting in direct seamless integration among telecom industries, vertical industries and developers, building up an open digital ecosystem. 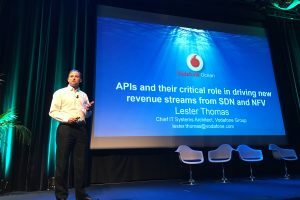 Chief System Architect of Vodafone Group Plc, Lester Thomas, in an interview expressed that Open API Map is able to resolve existing API decentralized and unstructured issues, attracting more industrial partners to engage in the construction of API standards as well as gradually having a cross industry, cross vendor, and cross systems standardized common language. Lester believed the Open API Map would provide an explicit guideline on API standardization, which is a key measure in simplifying and standardizing enterprise IT system integration. In future, Open API Map would, via business process, verify API functionalities as well as obtaining its new requirements. Documents of the GB922 standard compliance, corresponding to Open API Map can be downloaded on TM Forum's official website in mid-May. Huawei is a leading global information and communications technology (ICT) solutions provider. Our aim is to build a better connected world, acting as a responsible corporate citizen, innovative enabler for the information society, and collaborative contributor to the industry. Driven by customer-centric innovation and open partnerships, Huawei has established an end-to-end ICT solutions portfolio that gives customers competitive advantages in telecom and enterprise networks, devices and cloud computing. Huawei’s 170,000 employees worldwide are committed to creating maximum value for telecom operators, enterprises and consumers. Our innovative ICT solutions, products and services are used in more than 170 countries and regions, serving over one-third of the world's population. Founded in 1987, Huawei is a private company fully owned by its employees.